We produce for Italy and abroad maya moulds with border. 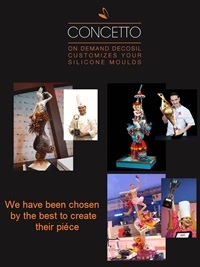 Italian leaders of silicone moulds, we create and sell for over 10 years maya moulds with border, food safe silicone moulds worldwide to confectioners, bakeries and Delicatessens. The moulds with boards, placed inside the egg - shaped polycarbonate mould, give you the possibility to create decorations on the egg, as if they had been carved directly on the chocolate. Attach the silicone moulds on the polycarbonate mould with a few drops of tempereted chocolate. Cool the chocolate down and realize the chocolate egg as usual. Chocolate will create a thin thickness. To extract the egg, slightly beat the polycarbonate mould untill the drops we used for fix the silicone moulds will fall down. Once you extracted the chocolate egg, carefully remove the silicone moulds.